The App provides a highly versatile and intuitive interface for the listener. 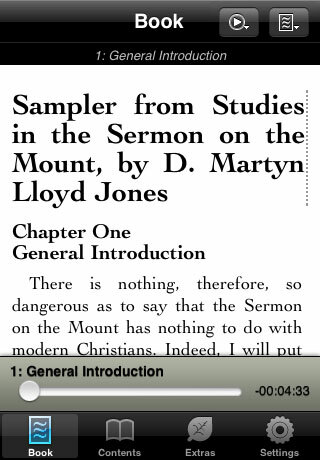 If desired the text appears as it is narrated. As well as standard fast forward and rewind buttons, if the listener wants to jump back or forward in the audio, they simply tap on the appropriate portion of the text and the narration follows. Extra content, videos, pictures, messaging and other features are all built in. Check out these iPad screen shots from the App in action.